Lesser Kestrels are a real challenge to photograph when in flight. 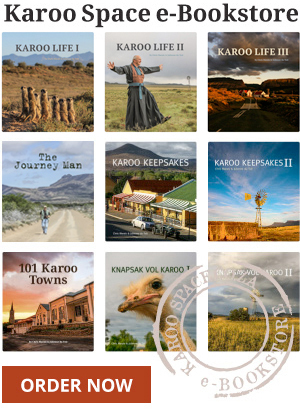 Of the overseas visitors that come to the Karoo in summer, the most numerous are not English or Dutch; they are Siberians and Kazakhs. 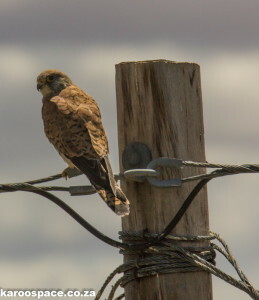 These specific tourists are lesser kestrels, neat little raptors that hunt locusts, spiders and mice while their breeding grounds in the northern Steppes turn to snow and ice. Lesser Kestrels are up usually up long before dawn. Tens of thousands of them arrive in the Karoo in November. 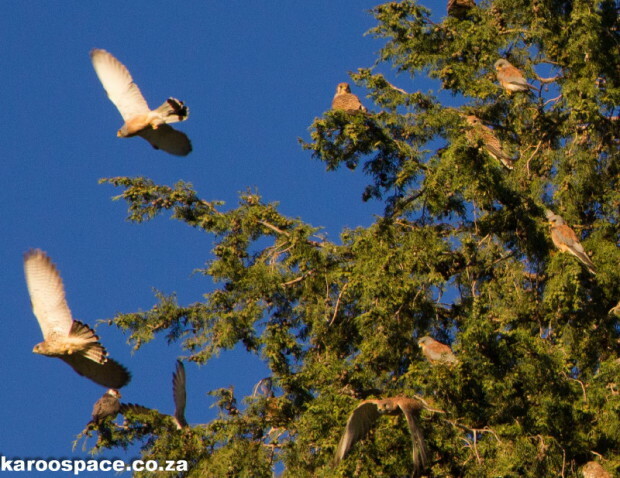 By day you’ll see them on fence posts or telephone poles, singly or in small groups or pairs, between towns like De Aar, Hanover, Philipstown, Victoria West and Britstown. .
At night they soar in clouds around their favourite towns, roosting in tall blue gums and pine trees once the sun has set. Before first light they’re off again to hunt. They separate to hunt along telephone lines by day, then roost together at night. They are inconspicuous raptors, not much larger than rock pigeons. The females have buff, spotted markings while the males have grey heads and chestnut-coloured body feathers. 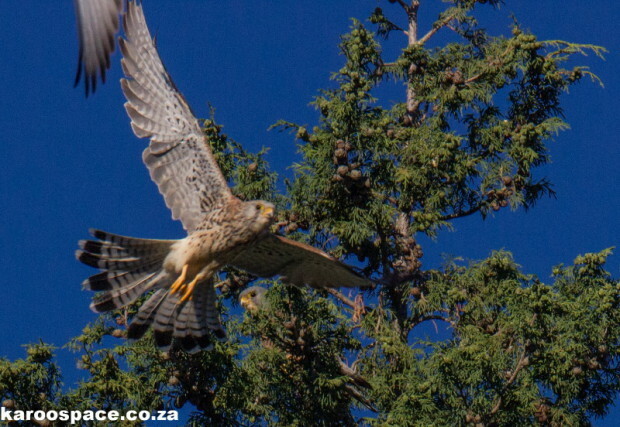 Once they arrive safely in South Africa, the kestrels moult all their feathers in symmetry, set by set. You’ll find them under the trees where they roost, worn to a nub after the long flight from the northern Steppes. Ronelle Visagie is known as the Valkie Lady. She works for Endangered Wildlife Trust, among other things, and every year in January can be seen driving around to the various Karoo towns, counting lesser kestrels. She can tell you how many come to the Karoo every year (roughly 60 000). But they remain mysterious. 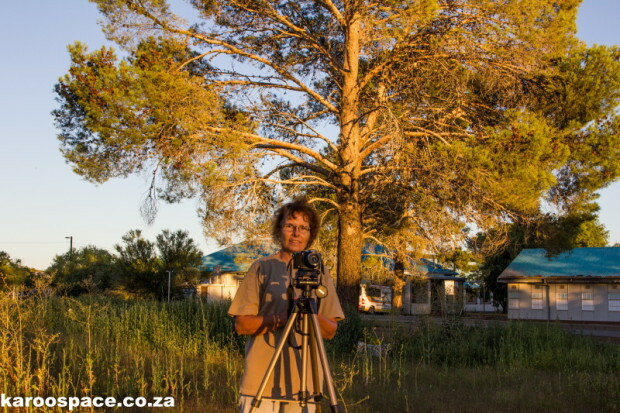 No bird or raptor expert, including Ronelle, could say why they favoured the Karoo and its small towns. Ronelle the Valkie Lady at a favourite Lesser Kestrel roost in De Aar. All we know about these useful birds has been gleaned from the irregular finding of ringed birds. In 1975 and 1988, birds ringed in Russia were found in South Africa. Later, a Saudi prince found a bird ringed in De Aar on his desert land. Much as Winston Churchill described their Russian homeland, they remain a riddle, wrapped in a mystery, inside an enigma. You can help solve some of the mysteries of Lesser Kestrels by contributing to the Endangered Wildlife Trust’s Birds of Prey Project. Call them on (011) 372 3600/1/2/3, email Ronelle on ronellev@ewt.org.za or visit http://www.ewt.org.za. great article —its so refreshing to find people who do not know all the answers. Such a joy to read your stuff Jules/Chris. Just love it!